The Chinese company best known for making knock-off Super Nintendo consoles is back again, this time with a mighty fine looking phone. 97973.com, the mobile-centric version of Chinese gaming news site 17173.com, reports the once console maker, Subor, is now making iPhone clones under its Little Tyrant brand. Back in the early days of console gaming in China, before the ban, Subor created the Tyrant, a bootleg of the Nintendo Entertainment System and the Super Nintendo Entertainment System. The consoles were sold under the Little Tyrant brand. Little Tyrant, to many Chinese gamers, was an introduction to console games. They were cheaper than imported consoles and played bootlegged cartridges. Subor's newest product, however, is in line with what it's been working on recently—mobile phones. What makes this new mobile phone, the X7, special is that in terms of outward appearances, it looks just like an iPhone, and not just any iPhone, but the iPhone 6. 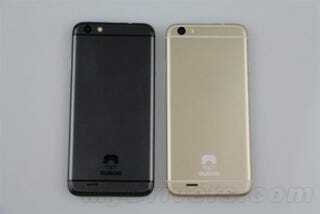 Just looking at the product shots, the thing screams the gold iPhone, the most popular color in China. They even threw in a "touch ID" ring, no doubt a non-functional one. In terms of specifications, the Subor runs Android 4.2.2, sports a five-inch 720p screen, a quad-core 1.3 Ghz processor, and 1 gb of ram. Per China norm, the phone is a dual sim. Unfortunately 97973's report doesn't go into the phone's gaming capabilities. There's no doubt in my mind that the thing will be filled to the wazoo with illegal emulators. Regardless of all that, the phone does look good. The biggest kicker is that the phone costs 699 RMB ($112). There's no word if there will be a 6 Plus version of the phone.